The MD-7112 Ceiling Medallion is 28" in diameter and has a depth of 2-1/2". Great price and superior customer service. These are magnificent. I have two very large ceiling fans. One is in the bedroom, the other in the family room and these took average looking fans and turned them into something phenomenal. Very pleased with my purchase as usual from UDecor. My order arrived the very next day I was able to finish my project as planned You all guys are awesome ...! 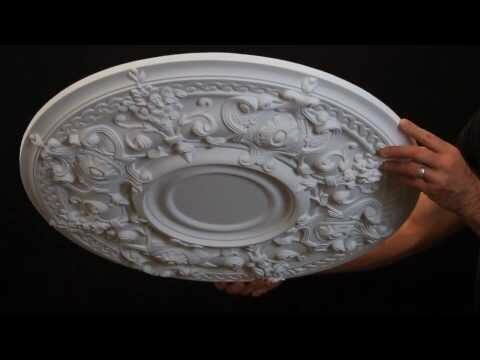 I was extremely pleased with the quality and craftsmanship of our ceiling medallion. I was looking for something that would complement our new foyer chandelier and I knew this would be the perfect fit. Once installed by my electrician I couldn't get over the impact it made and visitors often comment on the classic styling. Fast friendly service. I love this company and I tell everyone how awesome they are. Easy to install and looks great. Huge compliments from all that see it. This medallion was perfect and looks great. It was shipped promptly and we had no problems.